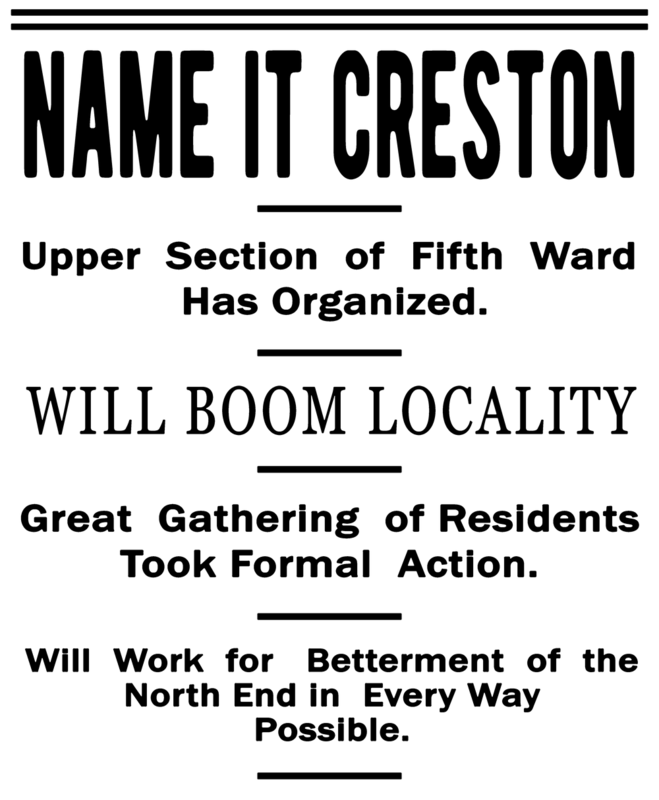 One-hundred-eleven years ago, the North End had no name. It was the people who lived here that rallied together to forge their own identity, in the face of violence, neglect, and reputation, as a part of town “on the crest of a wave of permanent prosperity.” -- “Up-and-coming” is what we hear most often to describe our neighborhood, and maybe it's always been that way, but a place doesn't come up all on it's own. It's Us, our friends, and our neighbors. It is the people that live and work here who will be responsible for what these streets and structures become, like those from over a century ago who came up and lit the streetlights, opened schools, and built a bridge over the Grand River. These are, like so many others around us, our ideals. We will organize. We will boom locality. We will take action and we will work for the betterment of the North End in every way possible. We don't want to make ripples, we want to create waves. Because here in Creston, our home has a name.